What does TDK stand for? What does TDK mean? 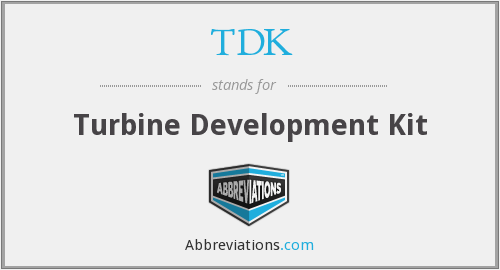 This page is about the various possible meanings of the acronym, abbreviation, shorthand or slang term: TDK. TDK Corporation, formerly TDK Electronics Co., Ltd, is a Japanese multinational electronics company that manufactures electronic materials, electronic components, and recording and data-storage media. Its motto is "Contribute to culture and industry through creativity". TDK is listed on the Tokyo Stock Exchange and is a constituent of the Nikkei 225 and TOPIX indices. Couldn't find the full form or full meaning of TDK? Know what is TDK? Got another good explanation for TDK? Don't keep it to yourself! "TDK." Abbreviations.com. STANDS4 LLC, 2019. Web. 22 Apr. 2019. <https://www.abbreviations.com/TDK>.